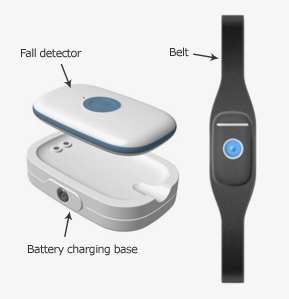 A highly sensitive fall detector incorporating accelerometers, capable of running a complex, specific fall detection algorithm in order to provide accurate fall detection. The telecommunications layer based in wireless technologies. It consists of an indoors telecommunications network based in Zigbee, a central computer (with or without Internet connection) and a mobile phone communicated with the central computer and the fall sensor via Bluetooth. All incidences and measures are stored in the server, so that they can be used as a monitoring data for the carers/doctors thus improving subject fall prevention and treatment. 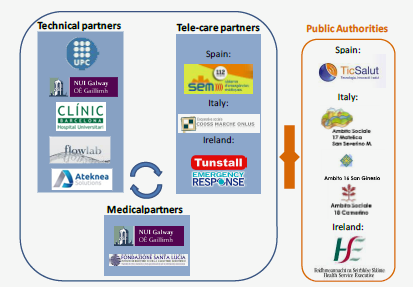 Once detected and confirmed, fall events are communicated by the mobile phone (or Internet, if this service is available) to relatives or health service providers (112) through the specific call centres set in every country/region/municipality. As an optional element, for persons suffering the significant gait difficulties, the system is also complemented by the i-Walker, an intelligent walker designed to detect fall risk for elders with significant gait difficulties. Usable at home and outside. FATE extends the fall detection (operating range) outside home thanks to the inclusion of the mobile phone with direct communication with the fall sensor. Therefore, the potential falls are detected when the person is carrying out their normal daily life activities such as shopping, attending daily care centre, visiting relatives or just walking around the neighbourhood. Great usability. The fall sensor has been designed to be light and comfortable. Total weight is 52 grams. The fall detector is worn directly over the skin, and is water resistant, so the user does not need to withdraw it before entering into the shower. Rambla de l'Exposició, 59-69 08800 Vilanova i la Geltrú, Spain.